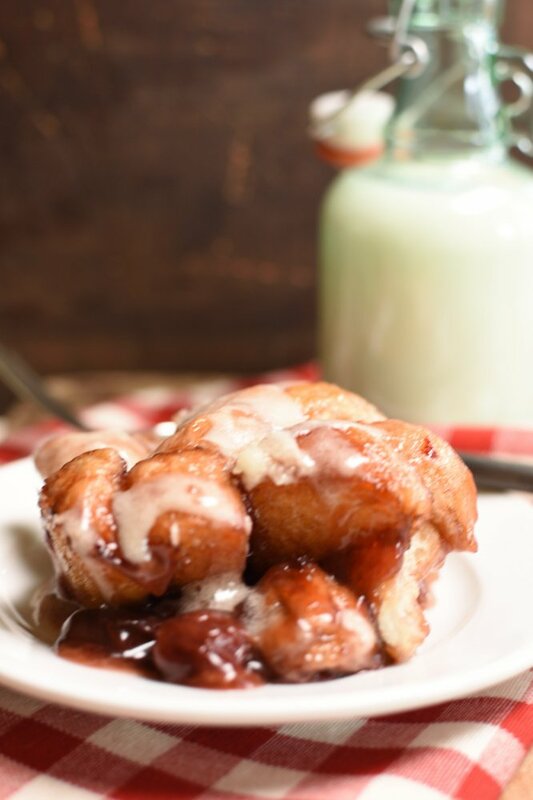 Cherry Bubble Up is another one of my favorite two ingredient, 5 minute breakfast recipes! 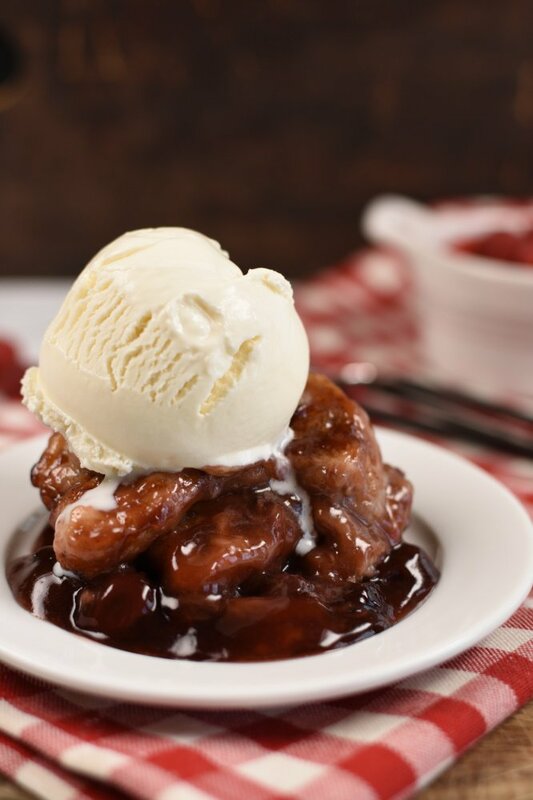 I’m all about serving it warm with a dreamy scoop of vanilla ice cream right on top too! 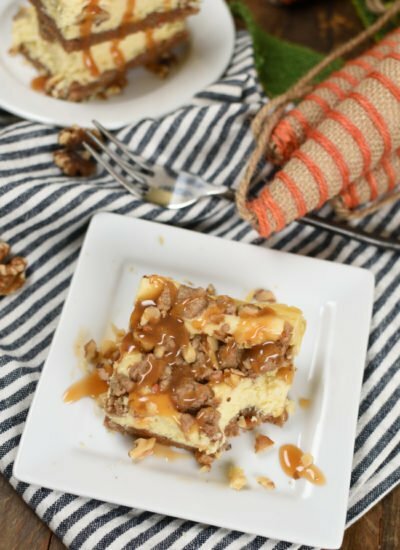 Call it breakfast, dessert, or whatever you want and it will still get rave reviews! I’ve been thinking about trying out Bubble Ups for quite awhile now and for some reason just haven’t gotten around to it! That was a mistake because this delicious Cherry Bubble Up pretty much rocked our world! So here’s your warning…there just might be more bubble ups coming your way! I can’t help myself! My mind is going crazy with endless Bubble Up options! 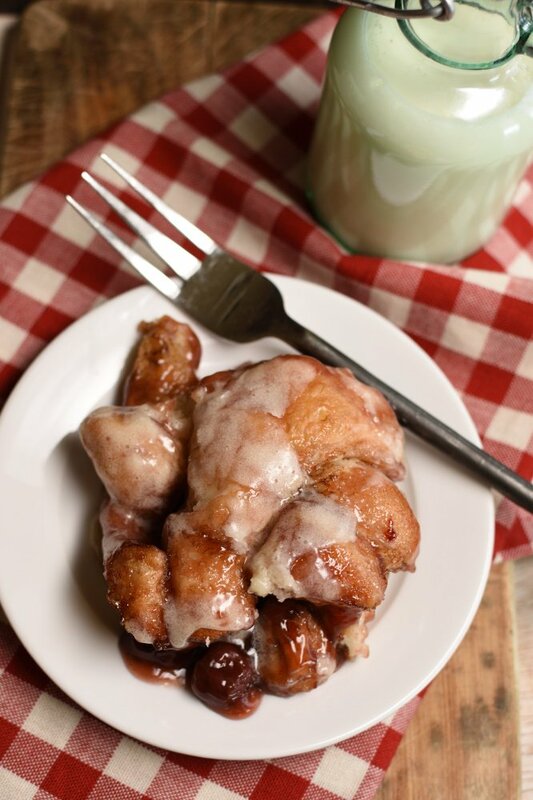 Thaw Rhodes Cinnamon Rolls just until they are soft enough to cut. I like to let them sit in the fridge overnight to thaw. Cut the Rhodes Cinnamon Rolls into quarters. 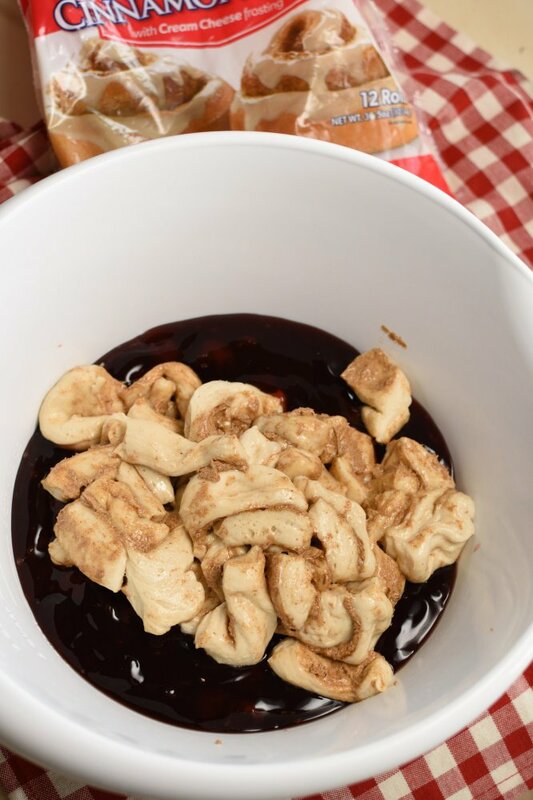 Put cherry pie filling and quartered cinnamon rolls in a bowl. 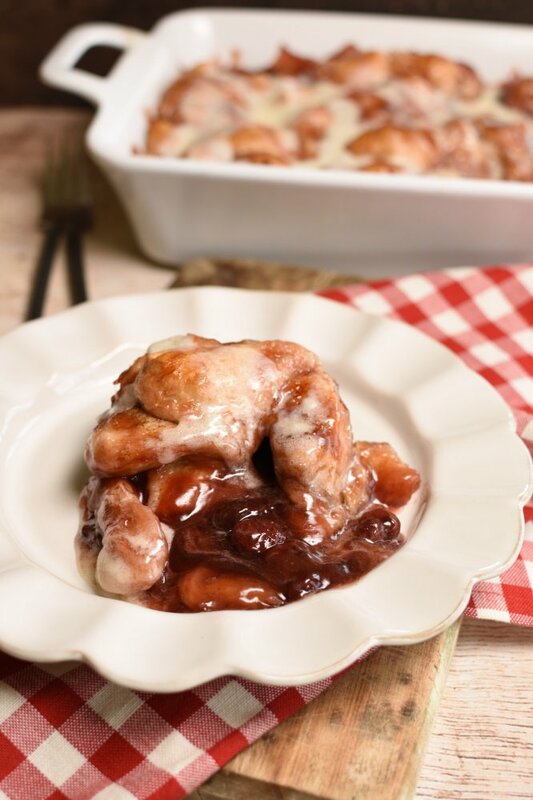 Gently toss to coat the cinnamon rolls with pie filling. 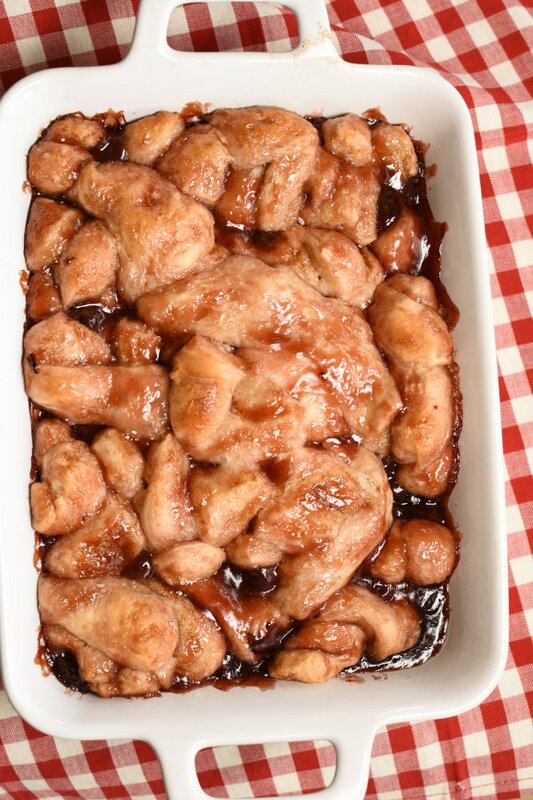 Spread cinnamon roll/cherry mixture in a greased 9 x 13 pan. Let sit for about 30 minutes in a warm place while the Cinnamon Rolls continue to rise. You might need to cover with aluminum foil for the last 5 minutes of baking so the rolls don’t get too brown. I spray the aluminum foil with nonstick baking spray first so it doesn’t stick to the rolls. After baking let rest for about 5 minutes. Drizzle icing package over Cherry Bubble Up. I told you once I get something like Cherry Bubble Up on my brain I can’t help myself! 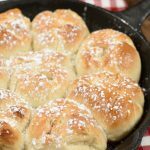 I can’t stop thinking about different fun and easy ideas for switching them up and making them extra tasty! 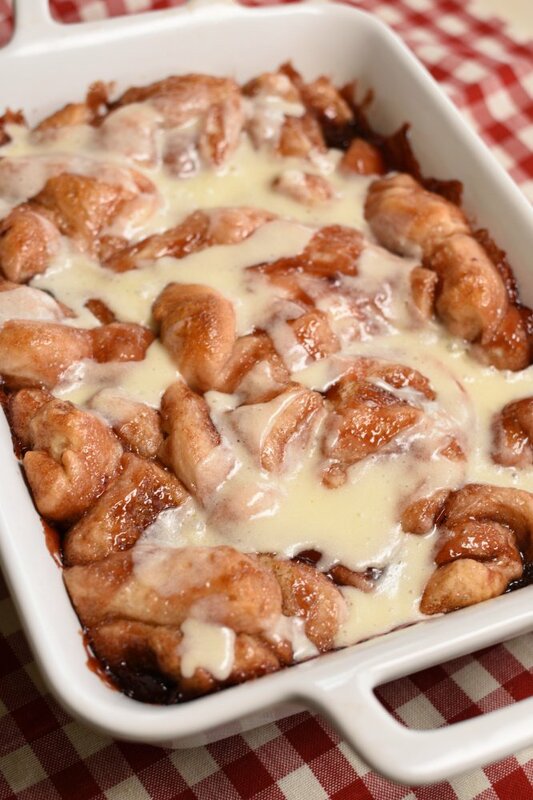 I think Rhodes Orange Sweet Rolls would be fantastic too! 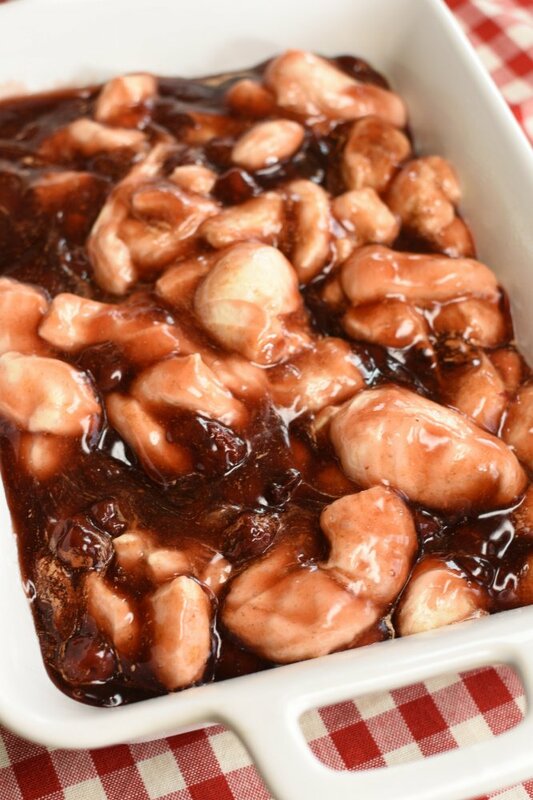 Add about a teaspoon of almond extract to the pie filling. Sprinkle chopped walnuts or sliced almonds over the top. 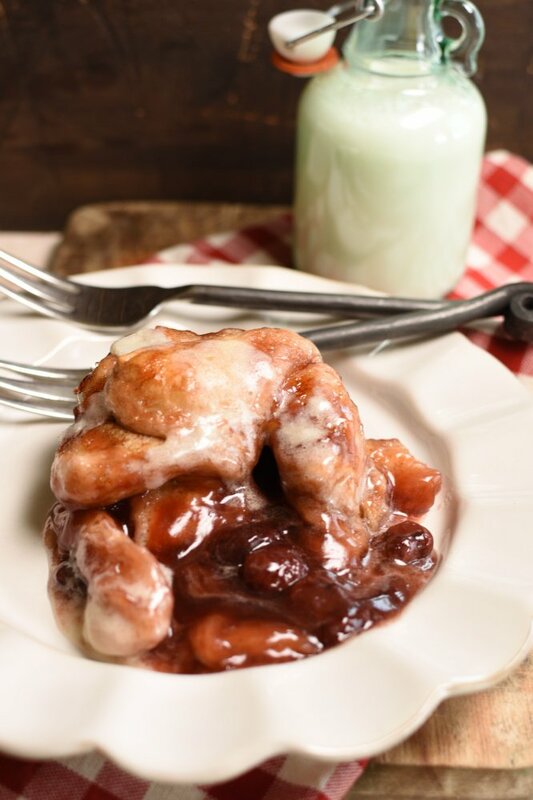 Using Rhodes Cinnamon Rolls adds a nice burst of cozy cinnamon flavor to the Cherry Bubble Up and almost makes it taste like a warm dreamy cobbler. Cherry Bubble Up would be perfect for Christmas because it’s so easy to make and such a crowd pleaser. Now, my Valentine’s Day is not going to be celebrated as a romantic holiday this year because my farmer husband is going to be in California for a farm show. Yes, I am married to this farm! But I’m thinking Cherry Bubble Up would still make a fun Valentine’s Day breakfast for the kids and I…and I’m feeling a nice makeup Valentine’s Day coming my way! I deserve that right? Hopefully your Valentine’s Day is going to be a little more celebrated than mine! And I definitely think it should begin with Cherry Bubble Up! Be sure to head over to Rhodes website for more fun ideas! 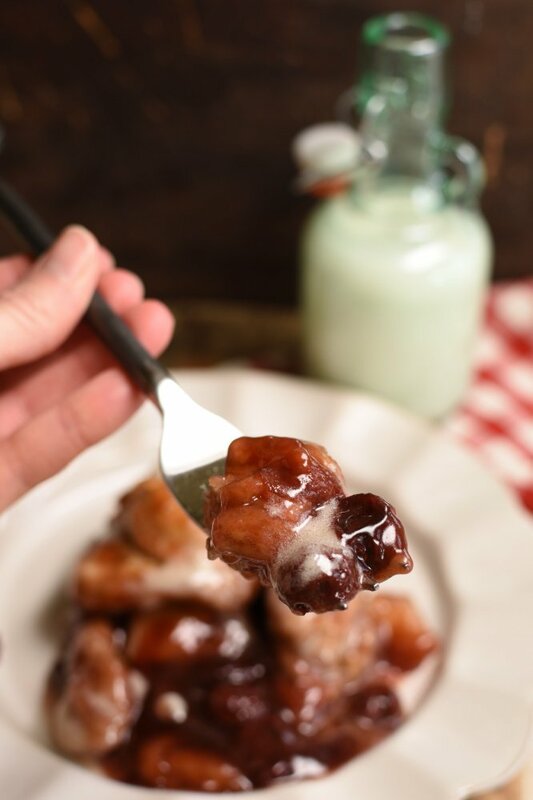 Cherry Bubble Up is that 2 ingredient, 5 minute breakfast you've been looking for! It's fancy enough for company and is especially festive for Christmas and Valentine's! 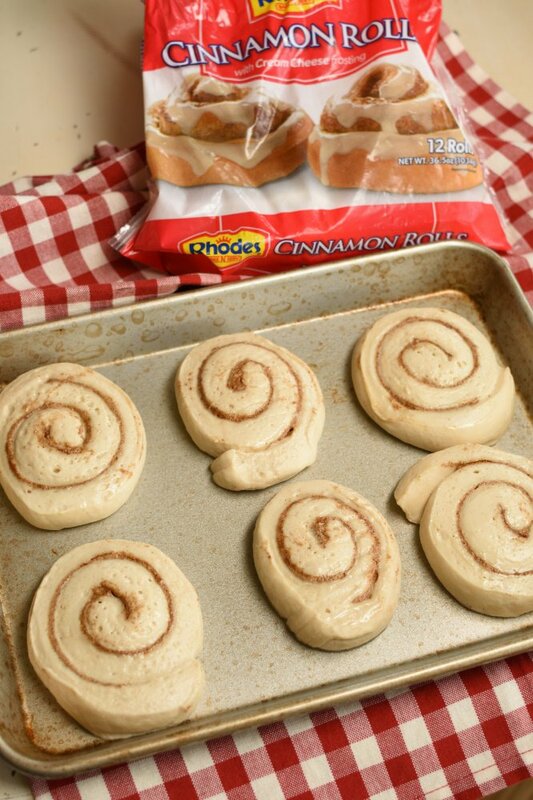 Thaw Rhodes Cinnamon Rolls (I think Orange Rolls would be yummy too) just until they are soft enough to cut. I like to let them sit in the fridge overnight to thaw. Oooh look at that gorgeous sweet icing glaze! This looks so delicious, and it’s such a creative recipe. I love it! Thanks! One of my favorite parts is that all I have to do is grab a bag of Rhodes Cinnamon Rolls and a can of pie filling. Since the icing is already in there it makes my life even easier! Love that! Amy, these look amazing! 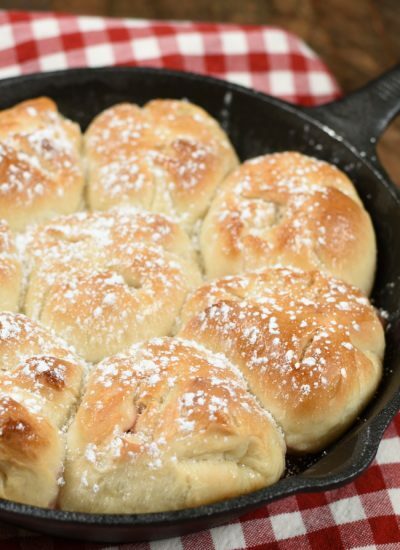 Bet they’d be really good with my Southern Fried Apple Pie filling too!! Cherry is always a good choice! Oh my goodness! That’s sounds amazing! My oldest son is in love with apple pie! I need to look your recipe up and make an Apple Pie Bubble Up for him! Thanks for introducing me to another delicious breakfast recipe, I never heard though. But looks delicious, I think I can have every day. It definitely hits the spot first thing in the morning! Totally worth waking up for! This is such a great idea. So simple, quick, and obviously hella delicious! I can’t wait for you to try it! It’s so simple yet so yummy! Those cinnamon rolls are genius! I love all of your suggestions for variations. I know! 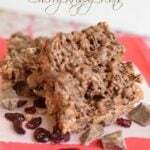 Having Rhodes Cinnamon Rolls in the freezer means I always have an awesome breakfast option! 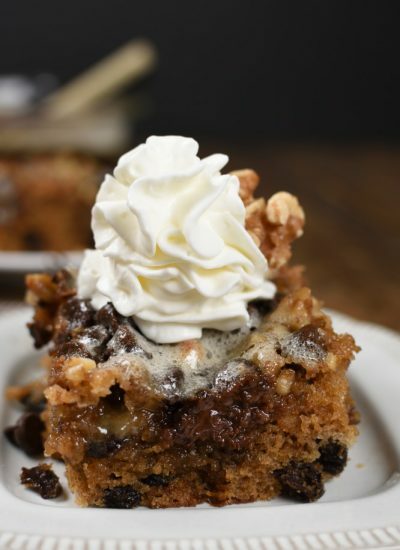 And yes…adding chocolate is always a good thing right! I make a lot of savory bubble ups, but never thought of making a sweet one… this is awesome!! Savory bubble ups make awesome quick dinners! This Cherry one is perfect for my sweet tooth though! 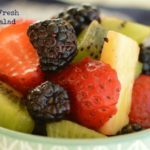 Such a great breakfast idea! My kid would surely love this! Kids love anything that doubles as dessert for breakfast right? Heck, I love dessert for breakfast! I can’t believe how easy this is to make. I am in love! 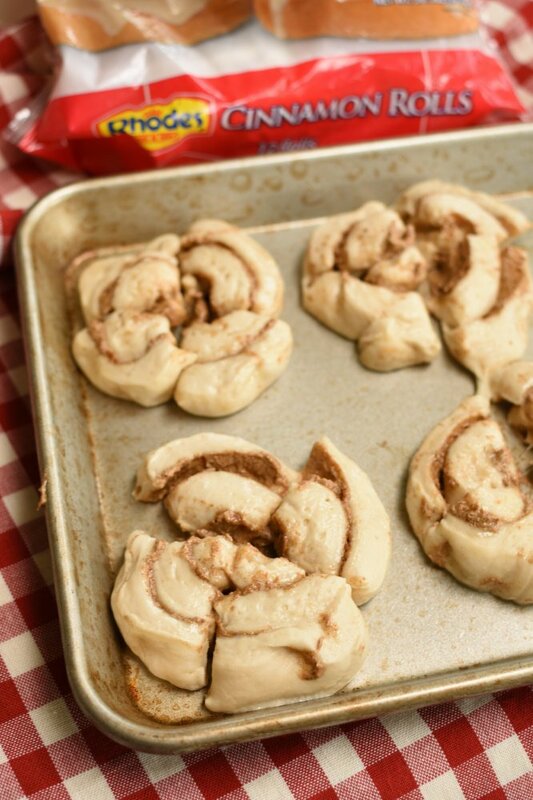 What a fun idea for cinnamon rolls! Can’t wait to try it! 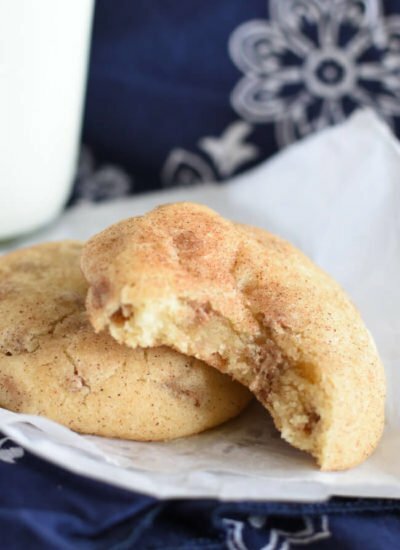 Using cinnamon rolls makes it super easy and adds those cozy flavors! This looks so delicious! I love how easy it is to make! Perfect ending to any dinner! It’s the ulitmate in comfort food! Oh my goodness I’ve never heard of bubble up and now it might be dangerous that I have! Bubble Ups are the easiest thing to make! And there are so many fun versions to try! I love using ready made ingredients and making something new and delicious! 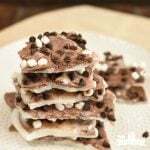 Can’t wait to make these for breakfast this weekend. Anything easy right? Especially on weekends! So yummy!